"The milder flavor and smooth texture of whipped cannellini beans well complement the flavor and texture of canned pumpkin puree, creating a versatile base for both a spicy bean dip and, with added liquid, a tasty bean soup (serve hot or chilled). Include fresh herbs such as parsley or cilantro to complete this quick and easy appetizer or aromatic side dish. Serve with plain pita crisps, crackers, or tortilla chips." Blend cannellini beans, olive oil, and lemon juice in a food processor until smooth; add pumpkin puree, parsley, paprika, garlic, chipotle pepper, salt, and pepper. Continue to process until just blended; spoon into a mixing bowl. Gently fold salsa through the bean mixture, avoiding crushing the vegetables. Cover bowl with plastic wrap and refrigerate to allow flavors to blend, at least 4 hours. Stir dip and garnish with parsley leaves and paprika before serving. 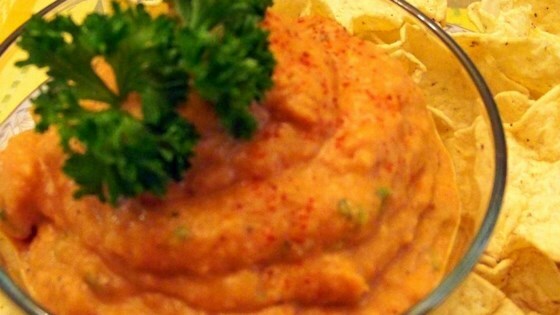 Chef John's recipe for this spicy, vibrant and versatile condiment is the bomb! If food processor bowl is too small, spoon blended mixture into a mixing bowl and stir in both pumpkin puree and salsa by hand. Ingredients may also be combined in a deep mixing bowl using a hand blender, but stir in salsa by hand. To convert to soup, add desired amount of liquid such as milk, soy milk, or vegetable broth; sauteed onions and peppers are some of the many cooked vegetables that complement this soup base. Did not like this very much. Will not make again.